For years now, PlayStation Portables have been smuggled into China. The government has looked a blind eye as has Sony, reports a Chinese news site. According to Chinese news site EEO, some estimates put half of the PSPs sold ending up in the Chinese market. That number does seem rather steep. However, these contraband PSPs could ultimately be helping Sony's bottom line. Sony has released several iterations of the PSP, none of which have legally gone on sale in China due to the country's game console ban. The manufacture of Sony's PSPs have been outsourced to Chinese factories. China's EEO quotes one gamer as stating that the majority of smuggled PSPs come from Shenzhen City in the country's south. The area is home to numerous factories, including the Foxconn facilities which have come under fire for a rash of recent suicides. Local venders go to Hong Kong, where the PSP is legally sold through Sony's Hong Kong branch. The portables are then taken back to Beijing to be sold. According to EEO's report, customs officials in Dallan City and Xiamen City have, in recent years, seized smuggled PSPs. The reason why Sony's PSP is not legally available in China is because the government has yet to approve the sale of the device. Kotaku recently explored this phenomena in a previous post. While the gray markets are 'illegal', they end up being completely legal because the Chinese governing body does not crack down on them for the sole purpose that they aren't a licensed seller. The best way to think of them is like a flee-market and not a licensed retailer. At "legal" shops in China, "licensed" material is typically sold. While smuggling does exist, the biggest issues facing China and Chinese gaming are rampant software piracy and console modification. 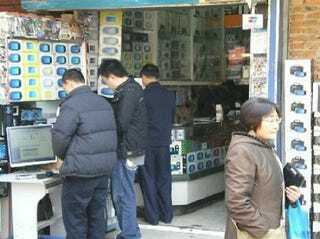 One electronics dealer in Beijing tells EEO that the widespread, illegal PSP trade could be responsible for increased sales. However, a professor at A professor of China University of Political Science and Law tells the site that the prevalent PSP smuggling ultimately hurts Chinese consumers and the healthy growth of the country's domestic game industry.